Spark plugs play a big role in starting your vehicle and keeping it running. When all is said and done, your car can’t run without them. The number of spark plugs you have under the hood depends on your engine size, but most vehicles have at least four, and some as many as sixteen. The spark plug has one end that takes in electricity to create a spark at the other end. This spark will ignite the air and gas in the cylinders, creating combustion and fire up your engine. As you drive, the spark plugs keep firing and igniting to keep your engine running. Because they are so essential to your vehicle’s operation, the condition of your plugs directly relates to the performance of your engine. The good news is that spark plugs are pretty durable and don’t need to be replaced often. If you get a “tune-up” for your car, chances are the technician is checking your plugs and replacing them if needed. However, if you are looking for an estimate of when they should be changed, the general recommendation is 30,000 miles, but check your owner’s manual for specifics. For the most part, changing spark plugs is rather simple. However, in some vehicles, it can be more involved. It really depends on where they are located under the hood and if there are any obstacles such as large parts or components are in the way of getting to them. Sometimes older plugs can be a little hard to pull out and may need special tools to get them loose. They are something easy to get changed at a service center, though, and usually don’t take very long to do. You may notice signs of bad plugs if yours are getting old. They can make the engine act differently. It may idle roughly, misfire or surge. You may also have trouble starting your car or notice it is using a lot more gas than usual. Another common symptom of bad plugs is trouble accelerating. If it seems like you aren’t getting the power that you usually have when stepping on the gas, then check your plugs. Your vehicle’s spark plugs are important to keep your engine running and performing at its best. 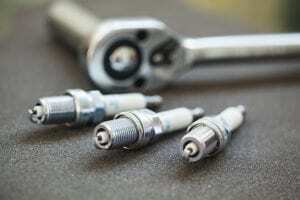 When the spark plugs get old or worn out, it causes issues that usually are very easy to spot. You can easily get them changed at a service center during routine car maintenance.